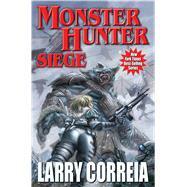 #6 in multiple New York Times bestseller Larry Correia’s Monster Hunter series. When Monster Hunter International's top hunter, Owen Zastava Pitt, was given a tip about some hunters who had gone missing in action, he didn’t realize their rescue mission would snowball into the single biggest operation in MHI's history. Their men are being held prisoner in a horrific nightmare dimension, and the only way to reach them is through the radioactive ruins of a monster-infested war zone. As if that wasn't bad enough, it’s also the home base of the powerful creature behind the devastating attacks on the Last Dragon and Copper Lake. It turns out ancient gods of chaos really hate trespassers. But this god picked a fight with the wrong crew, and now MHI wants payback. Calling on their allies, a massive expedition is formed, and with the odds stacked against them, a legion of hunters goes to war. Larry Correia is an award-winning competitive shooter, a movie-prop-gun master, and was an accountant for many years. He is the creator of the Wall Street Journal and New York Times best-selling Monster Hunter series, with first entry Monster Hunter International, as well as urban fantasy hardboiled adventure saga the Grimnoir Chronicles, with first entry Hard Magic, and epic fantasy series The Saga of the Forgotten Warrior, with first entry Son of the Black Sword. Correia lives in Utah with his wife and family.